It’s beginning to look a lot like Christmas! Time to break out the festive decorations and glitz the house with red, white and green. Chelan Fresh has elaborated a special holiday recipe that is decorative and delicious: an edible caramel wreath made entirely of adorable Rockit® apples. 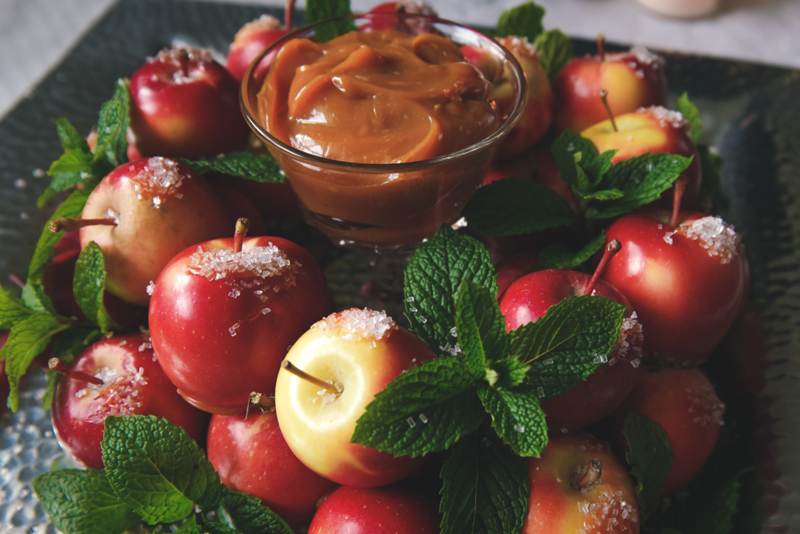 Kids will love dunking the frosted little apples into caramel before devouring them in three bites! This gorgeous wreath is easy to put together and makes for a playful and healthy holiday dessert. It’s perfect for sharing at a Christmas party. Maybe Santa and his reindeer would like one too…? Wash the tray and the apples. Set the apples aside. Put a stemmed dessert glass in the center of the tray. If you don’t have one, you can also place one small glass bowl face down, add a dab of caramel dip, and place a second small bowl right side up on top of it. The stemmed glass or bowl will hold the caramel for dipping. You can also serve the caramel on the side if you prefer. 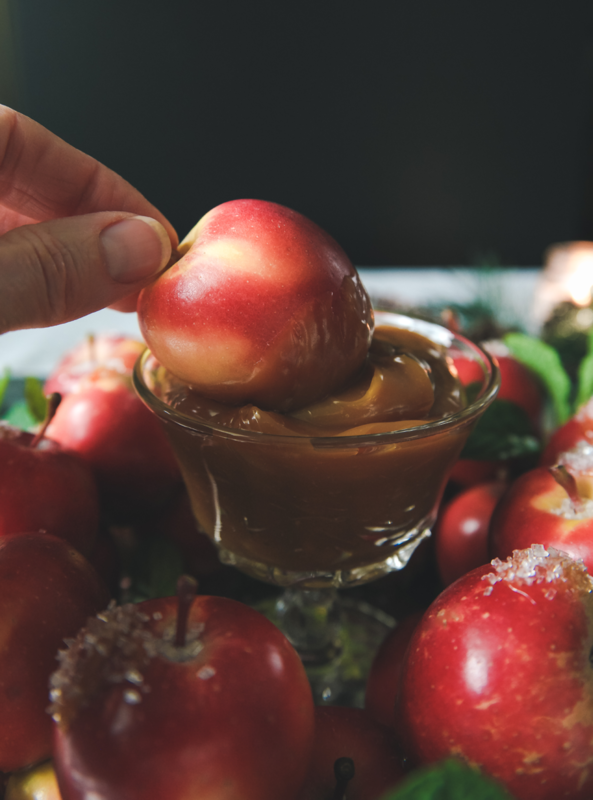 Dip the bottom of the apples in the caramel one at a time and start placing them around the glass or bowl in a circle. Continue until you have used all of the apples (2 layers). Tuck mint springs between the apples to decorate the wreath. Spread a dollop of caramel on a few apples and sprinkle with sparkling sugar to create a festive “frosted” look. Fill the stemmed glass or bowl in the center with the remaining caramel. 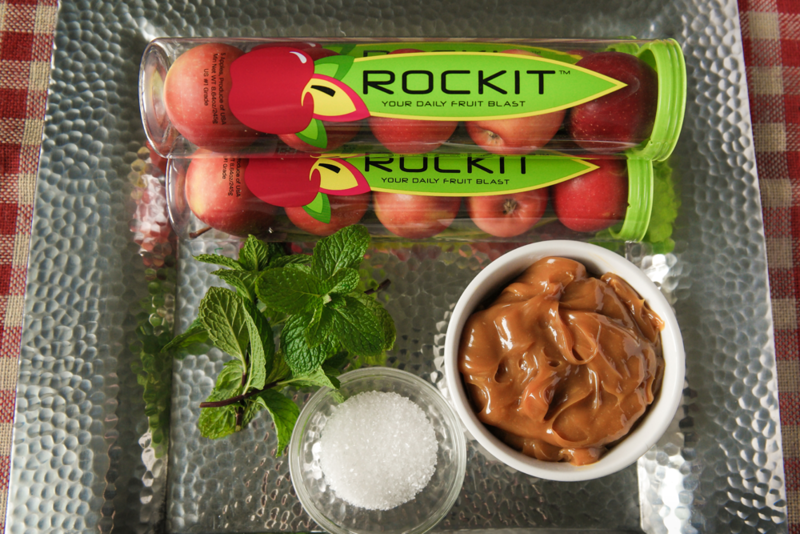 Rockit® apples work particularly well for this recipe but don’t worry if you can’t find any. Just look for the smallest apples you can find and try to stick to bright red or green – so festive!